An early-sixteenth-century alabaster tomb chest topped with the effigies of a man and a woman is set into the east wall of the south aisle in the parish church of Ashover (Derbyshire). The monument commemorates the gentry couple Thomas Babington of Dethick (d. 1518) and Edith, daughter of Ralph and Elizabeth Fitzherbert of Norbury (Derbyshire). 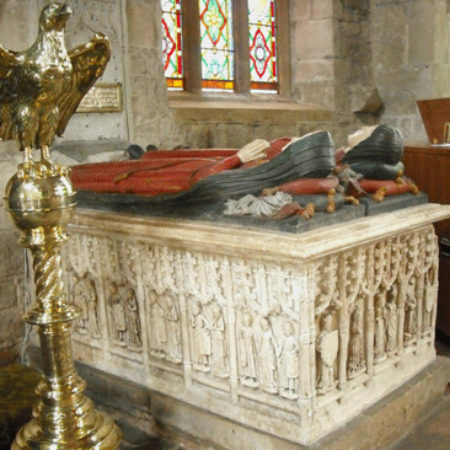 Thomas commissioned the monument following Edith’s death sometime between 1511, when the couple established a chantry chapel in the south aisle, and Thomas’s own death in 1518. He is shown as a civilian: the effigy wears a doublet with a standing collar above a collarless gown with heavy folds falling to the ground. The costume is completed by a linked chain collar which does not appear to be associated with livery (despite Gardner’s suggestion that it might represent an SS collar) and a belt with a purse and knife attached to it. Edith is shown wearing an early form of the English hood with plain lappets over a wide-necked kirtle with tight-fitted bodice and sleeves which falls in voluminous folds to the ground; a belt with a single clasp and a mantle complete the ensemble. Probably a product of the Burton-upon-Trent alabaster workshop of Henry Harpur and William Moorecock, the tomb chest bares striking similarities to other contemporary Derbyshire monuments by the alabastermen at Great Cubley and Chesterfield. Like these other monuments, the Ashover tomb chest features sculpted weepers framed in twos and threes under double canopies with elaborate crockets. Representations of the couple’s fifteen children occupy the long sides of the chest (the east end is currently flush with the east wall of the south aisle). The west panel of the tomb chest features an unusual composition: two angels holding shields flank a central scene in which Edith and Thomas kneel before St Katherine and a mitred saint who raises his right hand in benediction while his left hand holds a staff. Scrolls which would have featured painted supplications to the saints appear blank above the heads of the Babingtons in this atypical example of the commemorated appearing multiple times on their own tomb. A border inscription around the top of the tomb chest is nearly entirely effaced. 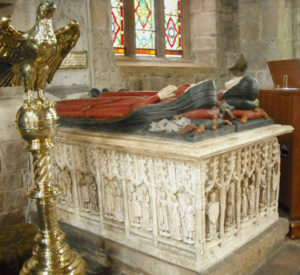 The two principal effigies are painted in deep red, dark green, and black, evidently much refreshed but offering a rare opportunity to experience an essentially medieval monument in the painted form which such effigies would have originally taken. In addition to the principal effigies, the weepers were also painted, and substantial traces of what may be original paint survive on the south facing panel and include blue, yellow, red, and black pigments. The figures on the south panel include a Knight of Rhodes (the Babingtons’ second son, John), a priest (their sixth son, Thomas), and a figure who may represent a lawyer (their third son, Ralph), as well as several civilians and women. Those holding shields — most of which appear from surviving traces of paint to have shown the arms of Babington impaled with others — probably represent those children of Thomas and Edith who married. Another thirteen figures on the north side of the chest facing the nave may represent children who died in infancy or childhood: the seven boys and six girls are all depicted identically and, although fewer traces of pigment survive on this panel, no indication of impaling is present on the heraldic shields the boys hold.